Celebrate This Holiday With Carter’s and A Giveaway! Are you like me? Do you love to take photos of your children and share them digitally with family and friends on your social media networks or better yet, send them as holiday cards to your family and friends near and far? I sure do! I love to dress my daughter up in the cutest and sensible, no fuss clothing and take advantage of the holiday season to make new memories that will last forever. 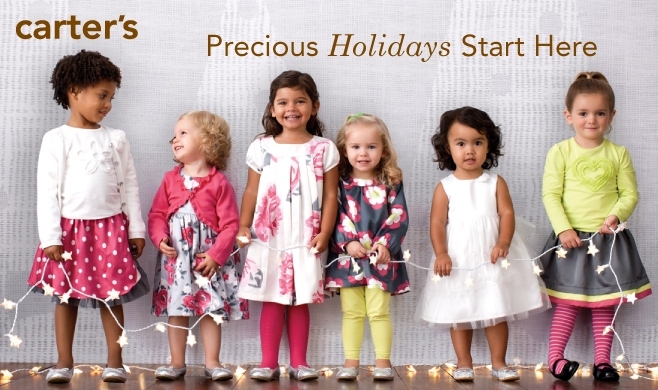 Carter’s offers fashion, comfort, sensibility, cuteness, and so much more and all at a great low price. Sounds great right? You can dress your kiddies in great quality clothing and it won’t hurt your budget. 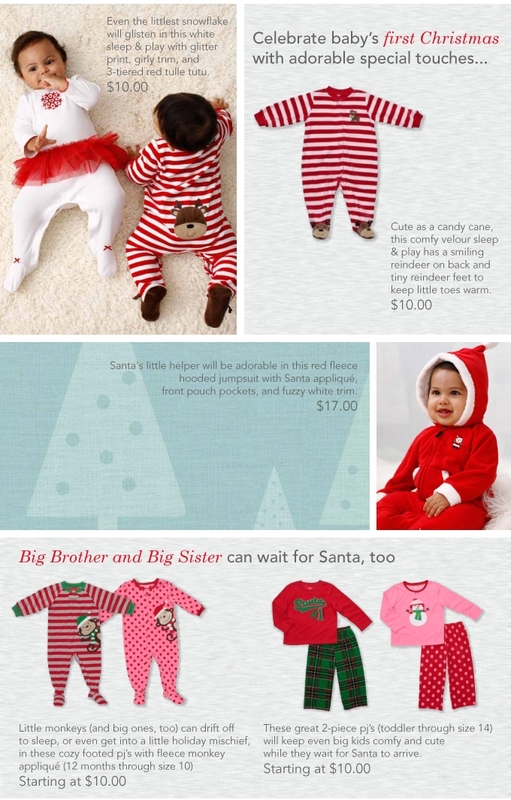 Have your baby looking as cute as ever in these sleeper outfits that will have your baby camera and Santa ready! How adorable they are! These are perfect for any baby! Check these super adorable outfits that will surely make this holiday extra special. Win a Carter Santa’s Little Helper Hooded Velour Fleece Jumpsuit with Santa applique and white fluffy trim (as shown above) here in size 0-6 months! 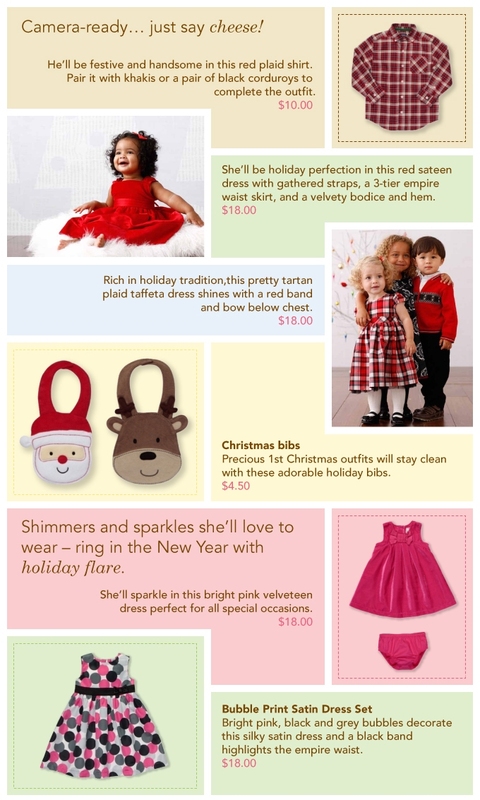 Its the perfect holiday outfit for any little boy or girl. Mandatory Entry: Leave a comment below telling me which outfit in the pictures shown is your favorite. That’s it! More Chances to Win: Each of the following counts for one (1) additional entry. Leave (1) separate comment for each additional entry. * “Like” Carter’s on Facebook by clicking here and tell them I sent you! * “Like” My Life Simple and Beautiful’s page on Facebook. * Follow me @Rachlwhite on Twitter. This giveaway ends December 15, 2010. Winner will be chosen randomly and will be announced here and also by email. This giveaway is open for U.S. residents only. Good luck and have a happy and fashionable Carter’s holiday! ¿Le gusta a usted tomar fotos de sus hijos y compartirlas en sus perfiles de Facebook o Twitter? ¿Le gusta usted mandar cartas a sus familiares con fotos de sus hijos? Verdad que si! A mi si tambien me gusta llenar los corazones de mis seres queridos con fotos de mi familia en estos tiempos tan especiales! A mi me encanta vestir a mi hija en los más bueno y más sensata! No hay que preocuparse con materiales y precios porque Carter’s le ofrece comodidad, sensibilidad, y todo esto a gran bajo precio. Suena muy interesante verdad? ¿Quiere usted ganarse el Santa’s Little Helper conjunto de ropa en talla 0-6 meses? (Lo veras en la segunda imagen al principio de este articulo.) Es la perfecta ropita para su bebe! Entrada Mandatoria: Dejeme saber cual de las ropitas que mencione en este articulo es tu favorita. Por favor deje su correo electronico en el comentario. Otras maneras para ganar: Cada una de las siguientes le dara una (1) entrada adicional. Por favor deje un comentario separado por casa una de ellas. * “Like” Carter’s en Facebook haz cliq aqui y digales que yo los mande! * “Like” My Life Simple and Beautiful’s page en Facebook. * Sigame, @Rachlwhite en Twitter. Este solteo se terminara el 15 de Diciembre 15 del 2010. Ganador/a sera anunciada por correo electronico y tambien aqui. Este sorteo es solamente para residentes de los Estados Unidos. Suerte y les deseo una Feliz Navidad llena de lindas modas de Carter’s! Disclosure: This post was not compensated by Carter’s. All opinions are 100% true. I am a long time buyer of Carter’s clothing for my child. They are just a great company and carry high quality products.